I’m not a fan of Bob Marley. Let me just clarify – I love his music, his sound, his dreads. But I don’t like making such bold statements when I’m in public company. For reasons unknown to me, Marley’s cult status has led to intense cross-interrogation as soon as anyone admits that they like his songs. Marley playing at Zimbabwe’s independence celebrations, 1980. Questions like these make Bob Marley’s music sound like a group of dinner party guests, interrogating one another on their respective knowledge of French white wines. I also get it – Marley’s music touches deep emotions and we each like to think that we have some similarly deep, individual connection that no-one else could possibly possess with his timeless voice. So, I’m not a fan of Bob Marley because it sounds as if it’s too tiring. But I do want to talk about a song of his, ‘Africa Unite’. It falls midway in his Survival album, which is focused on a militant vision of pan-Africanism. Survival was released just as the Zimbabwean war of independence from colonial-Rhodesian rule came to its end. Marley performed this in Zimbabwe in its independence celebrations in front of both Prince Charles and Robert Mugabe, paying himself for him, his band, their instruments and a massive PA system to be flown into Harare (although then the city was named Salisbury, cause, you know, colonialism). The music was a hit – he had to perform again the following day due to popular request. 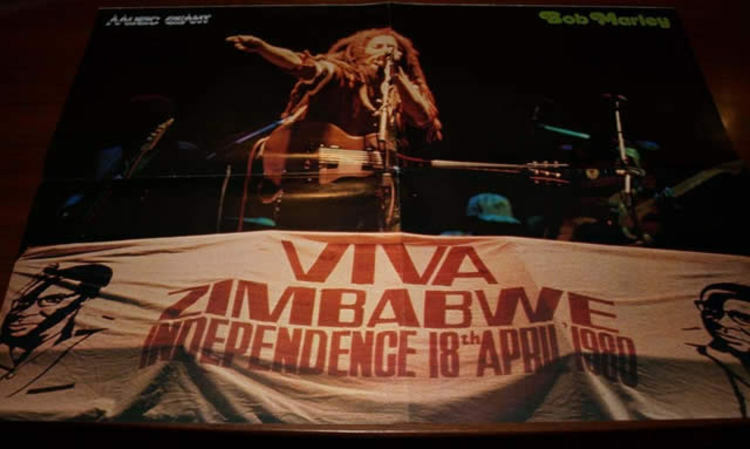 ‘Africa Unite’ is not a song that is explicitly militant, but it is the most obviously pan-African song on the album – an album which had the 48 current flags of Africa on its sleeve. Pan-Africanism is the argument for the unification of Africa as a political, cultural or social entity. But there’s plenty of discussion about what this actually looks like. Marley’s pan-Africanism makes its clear that his ‘Africa’ is not just the geographical boundaries of Africa, but the unification of the “children of the Rastaman”. He pleads for Africa to “unite for the Africans abroad!” He sees unification necessary because the children of Africa are “moving right out of Babylon” and they are “groovin’ to our fatherland” because “the children wanna come home”. The statement that the children of Africa “are movin’ right out of Babylon” has such deep layers of meaning. The reference to Babylon links the people of Africa with the Israelites, living in a culture that does not recognise them and their values, but instead treats them as second-class citizens. The secondary evocation of the journey of the Israelites comes a line later with “we’re groovin’ to our father’s land”. This references the Exodus of the Jews out of slavery of Egypt, but what is particularly pertinent here is the use of the verb “groovin’ ”. All this is packed into 2 minutes and 55 short seconds. ‘Africa Unite’ demonstrates Marley’s genius, the depth of his vision and the passion he cares about all of it. His voice soars like that of a prophet, crying in the wilderness, calling to an Africa, scattered across the globe. Gosh I have listened to this song too many times. I really bloody love it though. Treat your ears. PS – hullo readers, young and old. welcome back to the Fable of Bede. somewhat unbelievably, this blog has existed now for five years. i feel like trying to write some more stuff on it for the moment. i don’t think that it will last. read what you like. Over the world yesterday, protesters of both genders came out to protest against the philosophy and policy of Donald Trump. Protesters in a metro station, Washington D.C. Image via Reuters. Against this wave of worldwide public protest, one man and his whirling thumbs stood: Piers Morgan. The former newspaper editor and now breakfast anchor decided that he had to make a stand. And so he did. Imagine if there were a load of men-only marches today? The feminists would go crackers. This was the first of 152 tweets about the Women’s March which spewed from Morgan’s fingertips. In spite of all this, he focused solely around a few core messages: that the protests were against Trump’s victory and therefore anti-democratic; that he was against ‘rabid feminists’ and these protests were organised by them; that there should be a march by men in favour of ‘male gender emasculation’; suggestions that the march should be against Saudi Arabia, not the new US administration and additional smatterings of smears, jibes and low blows which seem appropriate an former Fleet Street editor. Morgan’s tweets are better written than Trump’s: having been the boss for two newspapers, you would hope that he has some command of English. The tweets convey the tone of a cheeky grinning chap but with a far more malicious message underneath. The language screams conversational: ‘crackers’, ‘bracing’, ‘silly’, ‘mate’ and so-on. He doesn’t depend on punctuation and capital letters to the same extent that Trump does to make his tweets sound angry: he has a far more sinister use of English. His supposedly chatty tone is the vehicle for the darker message of Morgan’s tweets. His tweets are more supposed to sound like the man at the pub giving you his opinions on immigration than a reasoned judgement. That’s because these tweets aren’t supposed to elicit reason: they are supposed to illicit anger. Morgan is a tabloid man through and through, representing the sad cesspit of nineties journalism which he managed to crawl out of, and so he understands that emotional battles are far more spectacular than ones which depend on rational debates. Each time that someone looks to engage with him on the level of the rational, Morgan seeks to drag it down to the personal, abusing how many followers they have, their appearance or just some good, old fashioned sweary insults. Find some subject to tweet on in which you know you’ll receive a large online public backlash. Make sure its not too dull. Type out your basic objection to this subject into your phone. Take a look over the language and make sure you change every word to be as hyperbolic as possible. Repeat it 150 times. Perhaps find some plasters for your thumbs. @piersmorgan how much attention would you need to finally feel secure? Full disclaimer: this post was based on this video, titled How (and Why) Donald Trump Tweets by the Nerdwriter. Today, Donald Trump became the 45th President of the United States in Washington D.C. Many, many, many people have written about Trump, about the November election, and what happened in the US. I’m sick to the back teeth of hearing about this orangutang which swung into the Whitehouse. So I’m not going to write about him. Instead, I want to write about the weather at the inauguration. The rain began just as the newly sworn-in President began his inaugural address. 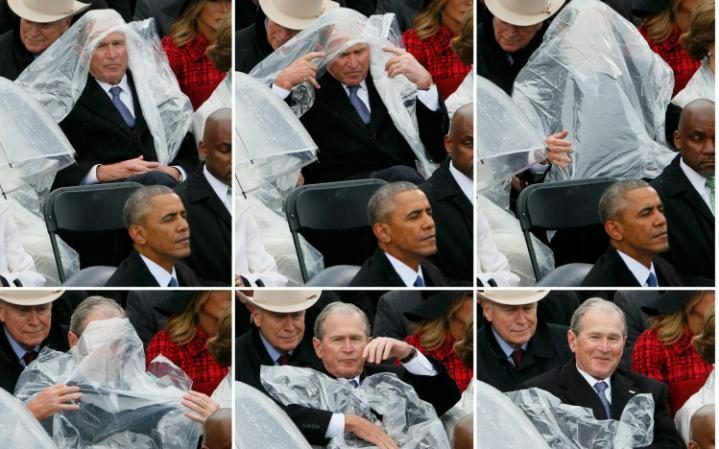 As the rain began to splatter onto the Donald’s jacket, umbrellas were rapidly dispatched and George W. Bush had a rather unfortunate incident with a poncho (although not his first slip up with one). The Reverend Franklin Graham consoled Trump’s sprit, if it had been dampened by the weather, by telling him that rain is a sign of blessing in the bible. Many commentators mused if he was referring to the time that God blessed Noah with rain. Inaugurations aren’t supposed to be particularly pleasant, warm affairs. The first inaugurations were held indoors, but two hundred years ago in 1817, on a warm and sunny March morning, the inauguration was held outside for the first time. The oath has only been administered a handful of times since then indoors, with Ronald Reagan’s second inaugural oath being the most recent of those occurrences when temperatures dropped to minus 14 celsius, or 7 degrees fahrenheit. Cold inaugurations have lead to tragedy: in 1841, William Henry Harrison gave an inaugural address that lasted one hour and forty minutes without a hat or a coat, leading to him contracting pneumonia and dying one month later. The inauguration is a ceremony not meant to be comfortable. JFK’s inauguration, 1961. Image via the Atlantic. Perhaps the most well known inauguration ceremonies is the one of JFK in 1961. It was the third coldest ceremony in US history as temperatures were down to -5C, or 22F. Watching Kennedy’s address, you can see his breath pluming with his speech and rising quickly above those gathered on the podium behind him. The sky is bright blue and the winter sun throws its cold but piercing light on those in attendance. The weather of that day seems to chime with the tone of Kennedy’s immortal words: the promise of the future that seems bright around the corner. The overcast sky didn’t scream the promise of the future which Kennedy’s inauguration commanded, but that doesn’t really say anything significant. What is more significant was how warm the day was. Trump’s inauguration was one of the warmest on record. The rain might have been of heaven, but the increasing warmth is something of human hands, whether the new President accepts it or not. With warmer climates and the north of the US predicted to become wetter, everyone better be settled to inaugurations that wheel out umbrellas. 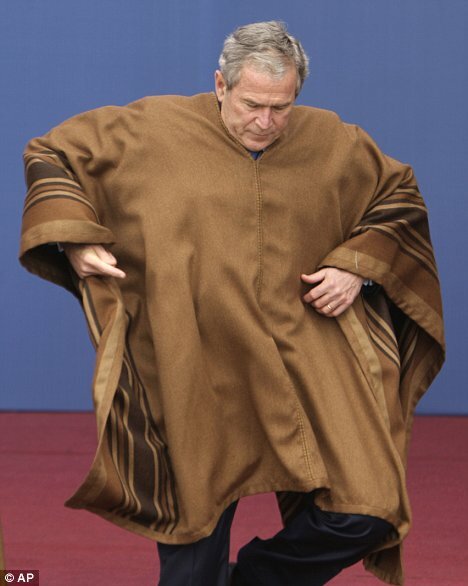 And George better learn how to wear a poncho. I have a single bed and a single duvet at home with two pillows. I have a double bed, a double duvet and four pillows at university. The first night back at my flat in Sheffield always feels like I’m a stone that’s hit a pile of feathers at speed. At least, it would have felt like that if there wasn’t overnight work on the road going on outside my flat. I sleep pretty easily, but the pneumatic drill below my window was still something of a small challenge. When you’re in the chair, all you can do is grimace and wait for the end. Today’s main event was getting a haircut. I get my haircut about once every three months and its an event that I have to build myself up to. From the moment you sit down in the chair of the barber and look grimly at yourself in the mirror in front of you, you have to place your faith in a being someone higher than yourself. A slight sip of the hand with the shaver or a snip with a pair of scissors can leave you looking ridiculous for months on end. This might seem as an overblown worry, but I speak from personal experience. In my second year of university, I lived with three other people: Eleanor, Tom and Nicola. Nicola’s hair needed cutting and she asked me if I would cut her hair for her. I’d tried french plaiting it once before and apparently that was enough to convince her. Nicola asked me. I jumped at it, wondering how hard the job actually could actually be. Over the next few days, I picked up some genuine scissors for cutting hair with, as I reckoned that I would do a terrible job with a pair from the kitchen. As it emerged, the choice of scissors did not help the matter at all. We decided to set up the barber’s shop in the bathroom, as it’d be easiest place to get rid of the trimmings once we were done. I placed a chair in the middle of the room and wrapped a towel around Nicola’s neck to protect her clothes underneath. At that point, the horror began. Cutting hair is an addictive process. The first few snips are a cautious affair as you take a little off. Suddenly, there is a slight slip: you took a little off on the right side of the head and you need to correct it. As you seek to cover up your small mistake, you make another, and yet another. Slowly, each snip represents a way of covering your mistakes yet builds up another one. Rapid snip after rapid snip builds up problem after problem. Halfway through, I showed Eleanor my handiwork. The look of sheer shock on her face communicated to me that there was a small problem in what I’d done. We tried together to see if there was any way of saving the situation. There wasn’t. The problem was that Nicola had asked me to trim her reasonably long hair. I’d ended up giving her a bob. A horribly mishapen bob. Nicola wasn’t aware of any of this as we were going along. She was enjoying chatting to me and I had no wish to give the secret up that I had encumbered her with an appearance that she’d hate. I realised that the inevitable had to happen: that she’d look in the mirror at some point soon. I gulped. “It’s ready, Nicola.” I was trying to sound upbeat. I’m not sure if it was worth it. The events of the rest of that night were too painful to tell here. She ended up going to a hairdresser to try to solve my mistake. On telling the hairdresser that a friend had cut the hair for her, the hairdresser asked her if I was really a friend. Nicola’s hair is now back to its normal length and you can’t really tell of the horrific damage that I had. Nevertheless, the moment that I sit down in the chair of a barber, my mind travels back to carving Nicola’s hair into a horrible mess and a wave of fear passes through me. Thankfully, I was very happy with my haircut. Remember kids- don’t ask your flatmate to cut your hair. Unless your flatmate is a hairdresser. Please, please, please shut up. I’m currently writing an essay on whether a random collective of people may be ascribed a moral status and it is taking every part of little brain’s energy to make this essay come around. Yet I can hear your whispering about nothing in particular and my head literally is near exploding from the sheer hell of the whole thing. I’m working, you see, on a point which is particularly difficult and I’m not sure if it can be resolved. I’ve been wrestling these ideas for the period of about two days now and I feel like I’ve just nearly, nearly, nearly reached some type on understandable answer that I’m happy with. But if feels like I’m having to knock steel into shape and hearing your continued whispering in the background is steadily making me want to slowly die. I can hear you whispering and talking about your lives and I’m sure they’re mightly interesting and important in some way or other as you discuss the whys and the wherefores of the clubs that you have been to and the parties that you’re going to go for and the essay that’s due in two months from now that you need to work towards but the issue for me is that I need to squeeze these ideas out of my brain and you’re kind of making my brain feel as if wants to give up on the degree and set up shop as a keeper of bees or chickens or antelope. The moment, actually, has now passed. You may be glad to know that I worked out my ideas, even without your help. Still, I feel you should know that you subjected me to something that might be described as terrible, inner pain. The guy scowling at his laptop sitting at the next desk. But this isn’t a post about SpaceX, their Falcon 9 rocket, or their rather ambitious plans for inter-planetary transport, although all of those are quite interesting. This is a story about the Vandenberg Air Force Base, where this rocket of the future took off from. Vandenberg lies on the Pacific coast of California, with stunning shots of the sea framing the sight of the SpaceX rocket launching into the cosmos. It belongs to the US Military, who lease out ‘launch-pad facilities’ to SpaceX, as well as 100 acres to the California Spaceport. It’s a two and a half hour drive from LA and a four hour drive from San Francisco. Surrounded by the dry heat of California, it’s something of an imposing place. The massive, terrifying Titan II nuclear missile launching from Vandenberg. Built in 1941 for training infantry forces, it suddenly found itself being placed at the forefront of the Cold War in 1957. Over two years, concrete flooded into the base as it was transformed into one of the United States’ principle nuclear missile bases on the Western sea board. Following the Soviet launch of Sputnik I, the famous satellite that proved the USSR could launch a nuclear warhead from their own soil that could hit any US city, expansion of the base accelerated. It is from this period that some of the most terrifying yet impressive pictures of America’s nuclear arsenal emerge. Perhaps the most terrifying of all of these was the Titan II, above. Compared to the slender build of the rockets that would follow it, the Titan II was as destructive as its namesake, the titans of Greek mythology who consumed their own children to protect themselves. Yet this destructive beginning has been contrasted with its pivotal role in the American Space Programme. In 1959, the first polar orbiting satellite (that’s a satellite that orbits both poles, apparently), Discoverer I, was launched from Vandenberg and it has continued to be the centre for launching polar satellites throughout its history. Vandenberg has seen a wide range of rockets take off from its launch pads to deliver satellites into orbit around the earth. That’s included the famous Atlas V and the Delta IV, as well as discussions for the Space Shuttle to be launched from there. After spending $4bn on preparing Vandenberg to have a space shuttle take off, there was no actual launch and the Shuttle took off from Kennedy Space Centre on Cape Canaveral. Expensive mistake. This brings us up to yesterday, which saw the SpaceX Falcon rocket soar above the Vandenberg Air Force Base. Elon Musk’s company intends on making six additional launches from the air base over the next fourteen months. With more and more successful launches, SpaceX is going to have a long line of governments and businesses lining up to have satellites placed into orbit. Meanwhile their part dream like, part reality plans for trips to Mars continue to attract the public imagination. Whether those will be from Vandenberg or not we will only find out. I’m not writing so many words on this air force base because I’m fascinated by the history of the American nuclear missile programme. Vandenberg is a huge concrete symbol of the twentieth century. Contained within its vast launch pads and its giant missile solos are two stories of both humanity’s ability to be both fascinated and disgusted by what lies beyond the horizon. It is a story of our wonder and our hatred. It is an image of both our wish to explore and our wish to kill. In spite of the inhumane gantries, twisting towers, and gnarled concrete, it seems overwhelmingly human. January 13th- What is this blog? There was snow laying fresh on the ground this morning. It was snowing when I hauled myself out of bed and it was snowing when I swept the drive for my mum’s car to shoot off through the wintry streets. Flakes swirled down from the morose clouds above and lightly dusted the shoulder pads of my jacket. Snow seems like something of a surprise for the British: an event that is either to be seen as some large inconvenience and how dare the weather visit on me at the moment, it is such an inconsiderate move, don’t the clouds know that I have to pick up that Amazon package which didn’t get delivered; or it is seen as a gracious gift from the heavens above, especially to kids who don’t have to get to go to school. We did not have this much snow in the UK. We never do. I was one of those kids once who would stare gleefully out of their window on a snowy morning, hoping that the immortal words would emerge from our parent’s mouths regarding the road conditions and how it was just too unsafe. Today, I remained at home all day, but my work sadly hovered beside me. This day has been filled with essay writing which is wonderful in so many varied ways and yet terrible material to write a blog about. So, instead, I’m going to write about the blog itself and explain a little of what I’m trying to do here. I’m currently messing around. Mucking about. I’m trying out new styles with my writing like a chef tests out fresh tastes in their recipes. I’m trying to find a writing style that feels like a tailored suit and that’s something that’s hard to do. But one of the best ways to do is to get on with churning out the content and adapting it as I go. So, for the moment, this blog is in a pretty fluid and pretty organic place where the writing will hopefully develop and the character within it flourish as well. That may be sometime soon or it may be for a while yet. But the simple act of having to write interesting stuff about how my day has gone is something that feels so positive, as it really gives the continued impetus I need to write. So this organic nature has some kind of structure. The snow stopped just after ten and tonight there is little sign that it was even about. A clear sky and a bright moon tonight herald the creaking of frost in the grass outside. I had a fish pie tonight which I actually enjoyed, mainly because it was made out of pastry and not mashed potato. I typically hate fish pie, finding it bland and stodgy (sorry mum!). But this one (also cooked by my mum) was a thing of true beauty and may well be catapulted onto the top ten list of pies that I’ve ever had. If that’s not a good way to round off a day of dull essay writing, then what is? The late, great detective novelist P.D. James said of the crime genre that its true value lay as a vehicle of exploring human relationships, instead of exploring crimes that humans commit. Good detective novels don’t spend their time focusing on gritty details of the murders that their pages are filled with, but instead take you inside the mind of the victim, killer, detective and the other host of characters which populate the novel. The difference between fun detective novels, such as the ones by Agatha Christie, and the great detective novels, such as the ones by writers such as P.D. James is that the former offer cardboard stereotypes interacting in a cardboard way; the latter present fully formed characters which kick you with their realism.1 Where does the recent BBC’s adaptation of Sherlock fit into this? Season 4 sees Sherlock return with grizzle. If you were to read the novels of Arthur Conan Doyle, or see the various traditional adaptations of them done by a variety of television and film producers over the past fifty years or so, they obviously fit more closely into the ‘fun’ category than the ‘great’ category of detective fiction. Conan Doyle doesn’t want to use these books to explore the wider characters of London; he wants to use them to explore one principle character: Sherlock Holmes. Yet Conan Doyle’s Holmes is hardly a man who you would find strolling around. With a mind which no-one else could have and a coldness which would give the White Witch of Narnia a reason to pull another jumper on, the Holmes of Conan Doyle is a celebration of what true, rational thought can do against beliefs in the supernatural. But that’s a celebration, not an exploration. We can’t understand the Holmes of Conan Doyle as really having any fears or lingering doubts or repressed emotions because Conan Doyle doesn’t want us to understand him having any of that. So what of the Sherlock of Mark Gattiss, Steven Moffat and Benedict Cumberbatch? The Cumberbatch Sherlock is a true exploration of this man. It’s trying to understand how this high functioning sociopath functions. Through his various exciting adventures of trying to solve a case, save John or avoid his brother Mycroft, we’re able to see Sherlock’s thought process worked out but also begin to interrogate how his emotions creep into that. His love for John, Mary, his brother and Mrs. Watson. His hatred yet fascination for Moriarty. His absolute contempt of those who bring him boring cases. This lays out Sherlock. It uses crime as a vehicle for exploration. It swings the needle of this work from fun to great. And I think that’s what has made it such a hit. In some ways though, I feel the show has overdone it. Increasingly, the most recent episodes (trust me, this is a spoiler free zone) stop focusing on the crime but on the relationships that run between Sherlock, John and Mary. The crimes are now running to the tune of the relationships, not the relationships running to the tune of the crimes. And that starts to miss the point of great detective fiction. Great detective fiction is about exploring how humans interact at this destructive, chaotic point within their lives where they are dictated to by the events that surround them. Once that element of chaos begins to disappear, the detective fiction moves to being simple drama, which has the danger of being bland. Which would be a pity with Sherlock. 1 Although there was an excellent adaptation of Murder on the Orient Express done by ITV a few years ago which saw David Suchet interrogate the character of Poirot to the point of near destruction. In the upstairs of my house we have a small toilet which my sister painted a light mint green five and a half years ago. In that toilet, we keep two items: a wooden pole that is about three feet long and has a rust-covered hook on the end of it and a piece of worn laminate boarding that has the look of faux pine. These two objects grant whoever picks them up access to a land of mysteries, adventure and danger: the attic which lays just beyond the white trapdoor in the ceiling next to the toilet. Not our attic, but one that was about as cluttered as ours. Tonight, my dad pulled the trapdoor down using the pole with the rust-covered hook on the end of it. He yanked the ladder down, placing its feet carefully on the piece of faux-pine laminate floor boarding so as not to mark the carpet underneath it. Then he and I spent forty minutes bringing piece after piece of furniture out of the attic and began to pile it along the corridor of our house. It marked the beginning of the process of cleaning out the attic. Attics can be used for various things. Bedrooms. Living Rooms. Kitchens. Music Studios. Photography Studios. Artistic Studios. A room for toys. A room for writing in. A room for lying in. A chemist’s laboratory. An astronomer’sv observatory. A spy’s headquarters. Attics have potential for all of us. I use ours as a time machine. As they begin to be re-visited and re- examined, I’m brought face to face with objects that have the clearest of memories for me and which I haven’t touched in years upon years. A yellow submarine which I used as an occasional spaceship or a notebook that I scrawled in at the age of seven or a cricket ball that I threw with sweaty hands when I was thirteen and wanting desperately to be better at sport. The objects that are contained within attics take us back to when we were different people- children or teenagers or grown ups. They pop up again in our lives and ask us to remember who we once were. The objects of attics bring us face to face with our previous selves in a sudden and shocking way- in a way that makes you question whether you want to see much of this previous person. My parents are moving from Dudley to Stoke on Trent, so the attic has to be cleared. That means the endless biology textbooks my sister and I have collected over the years have to be removed from the attic and carted away. The contents of the attic are now spewed across our house, leaving all these memories open and welcome to injury. Tonight, my sister picked up a poem that I’d written when I was younger about some curtains. She started to read it but I snatched it away. It felt to cutting to hear the words of this boy I once knew being mocked. I guess that time travel isn’t always fun. Imagine this. A rebel ship flying toward the setting sun. Or a stout droid, wheeling slowly down a corridor. The raspy, robot breath of a black caped figure who is part-man, part-machine. If you’ve spent any time watching any of the Star Wars series, you’ll be able to mentally re-create these moments in a flash in your mind. They are the sounds that define the movies and that pepper the trailers. I want to talk about these sounds, these images, these moments in the context of Richard Wagner’s leitmotifs. Richard Wagner composed a series of operas in the 19th Century, including the famous Ring Cycle, Tristan und Isolde, The Flying Dutchman and others. His operas would typically last over several long hours and his greatest epic, the Ring Cycle, contains four operas. If these operas are performed without any breaks, they would still occupy sixteen hours of music. Wagner’s issue in writing these operas was being able to keep his audience understand where things were going. His answer? Leitmotifs. Leitmotifs are short melodies that represent a particular figure in the opera. This is the one for the main character, Siegfried. This is the one for the Valkyries, of which a rather famous march was composed. This is the one for Valhalla, home of the gods. This is the one for the ring itself around which the whole cycle of operas swings. These tunes are perseverant little things, and by the end of the opera humming them stirs up a lot more than loud Germanic singing. It conjures up the images of heroism, sacrifice, love and betrayal that all take place in the Ring Cycle. They’ve had a potent effect on anyone whose watched the operas, and perhaps their most potent effects is when a flash of them appears within the melody. A quick suggestion of the Siegfried theme can rouse an audience. There’s almost 18 hours of Star Wars footage following the release of Rogue One. To make sense of this particular epic, directors have used leitmotif throughout the movies to engage the audiences at crucial times to think “oh, this is what’s happening now!” The raspy wheeze of Darth Vader grounds us in the reality of this cruel, angry man; the sound of a lightsaber hastily drawn takes us back to the fast spirited action of Luke; the sound of a fighter roaring into the far distance reminds us of the desperation of the rebel cause. Rogue One is a feast of leitmotif. It’s filled with the familiar themes of A New Hope that we’ve become so familiar with over the years since it was first shot. From the CGI recreation of the faces of both Carrie Fisher and Peter Cushing to the sudden cameo of Cornelius Evazan (that’s this guy), the film gives us what we crave: nostalgic memories of being a kid in a cinema and holding a rebel ship tightly in hand, sprinting across the living room floor. But drinking from the gourd of leitmotif is a dangerous business. Wagner is often careful to develop his leitmotif carefully as characters are developing, meaning that our ideas about the plot move forward with the actual drama. Continually re-using leitmotif with advancing them artistically can lead them to becoming stale cardboard cut-outs which act more as puppets to keep us grinning rather than anything that is animate, meaningful or alive. And that is dangerous. That’s not a criticism of Rogue One: I thought it was a cracking film and took an original take on the Star Wars story, including themes on sacrifice which have been over looked many times. Yet it is a critique of its approach. Done over and over again, then there won’t be much more juice that can come out of this lemon.